Why giving back is important for your career. It is my strong point of view that one of the best ways to create professional progress is with a purposeful strategy of giving back. Now, I’m sure you are all thinking about examples that disprove that statement, but lets be honest, if you were a counter example, someone who could ignore others and still get ahead, you wouldn’t be reading my leadership development blog. You would be on your private jet or something. I stumbled on this point of view accidentally. It’s not like I didn’t care about giving back before, I just didn’t see the relationship to professional progress. I began my deliberate practice of giving back in 2010, when I needed something meaningful to focus on and I wanted to find a new way to think about progress. At the time I didn’t understand what I actually learning, I just knew I was heading in the right direction. Focusing on others helps me find joy even when things are hard. In fact, giving to others is its own kind of bonus. Giving back not only impacts those who are directly involved, but also helps build broader and deeper networks, authentically. 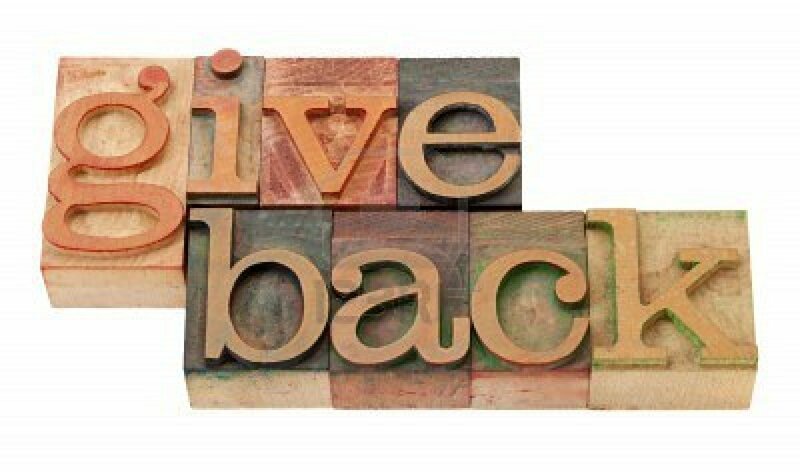 Giving back helps me avoid burnout because it gives me a more realistic definition of success. It can make you feel good about yourself, and when you feel better, you do better. It makes you more confident to ask others for help you need. It can give you energy, which will give you more productivity. As background — Ada Lovelace Day is a call to action to help fight invisibility of women in STEM. The idea: We need to have more visible role models of women in Science, Technology, Engineering and Math so that girls can imagine themselves in those roles, thus increasing the number of girls in these fields. We need this to happen not just for social justice but for the economic growth. Women in STEM fields have a huge impact on the global economy and are a critical resource to help solve the most complex problems we face in the 21st Century. Ada Lovelace Day 2013: fight the invisibility of women in STEM! October 15 2013 will be the fifth annual Ada Lovelace Day, an international celebration of the achievements of women in science, technology, engineering and maths. Ada Lovelace Day is about sharing stories of women — whether engineers, scientists, technologists or mathematicians — who have inspired you to become who you are today. The aim is to create new role models for girls and women in these male-dominated fields by raising the profile of other women in STEM. You can participate in Ada Lovelace Day by attending Ada Lovelace Day Live! in London; attending one of the more than 20 other worldwide events; or by writing about a woman in STEM whose work has inspired you, publishing the story on October 15, and adding it to the Ada Lovelace Day story collection. I am taking it upon myself to compile a list of the women on twitter who inspire me in and around #STEM, and to ask for your help in expanding it, either by reminding me of who I missed*, or introducing me to people I need to know. I want to be someone who helps bring more people to the front to stand out as role models. I realize that many of us downplay our ability and responsibility to be a role model for others and I want to suggest if not you than who? Women who are CXOs leading the charge. Women in Engineering, Science, Technology who are builders, Doers, Leaders and Makers. I encourage you each to contribute to causes like Ada Lovelace Day recognizing not just the big names, but the breadth and depth of contributions that are happening today to bring forward the power of women to benefit our world.